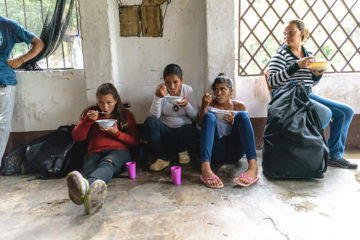 Heavenly Father, today we rejoice in the vision of Pastor Jesus Paez, who felt led to help Venezuelan migrants passing through his community of La Don Juana, Colombia. We are delighted that he had a desire to provide some relief along the journey and that his own community rallied around him to meet the needs. With tens of thousands of Venezuelans arriving in Colombia each day, the vision had to grow even larger and bolder, and your people responded. We are thankful that Samaritan’s Purse came alongside the ministry run by Paez and his daughter Viviana by vastly improving the facility, underwriting the rent, purchasing groceries, and providing an electro-chlorinator to clean the water. Lord, please continue to use this place as a light and refuge for the Venezuelan people desperately seeking better lives for their families as their home nation implodes. Continue to generously provide food and supplies. We celebrate those who have heard and responded to the Gospel through the shelter. May more be blessed for eternity in La Don Juana. And we continue to pray for the nation of Venezuela as it suffers through this terrible time in its history. In Jesus’ name we pray, amen.